Tacos Don Nacho is one of the greatest restaurants in OKC, and you would be doing yourself a disservice if you did not try it at least once. Located on Council Road between SW 36th and 38th, Tacos Don Nacho is a mexican restaurant that prides itself on its quality service and great food. What sets Tacos Don Nacho apart from other restaurants in the area is the freshness of its food. The chips and salsa are an excellent first impression. The salsa tastes like it was made minutes before being brought to the table, and the chips are still hot and crispy. This delicious appetizer only serves as a herald for what is to come next. Deciding on the meal you want is a difficult choice as Tacos Don Nacho has a rather large menu, each item looking as equally delicious as the last. 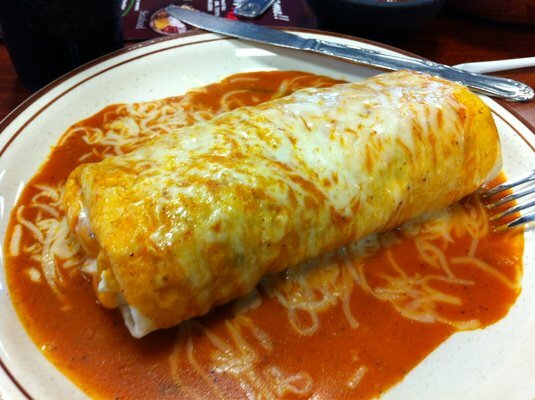 I decided to settle on the Wet Burrito, a beef burrito with onions and peppers covered in taco sauce and melted cheese. The burrito itself was huge, about 8” in length and as big around as my fist. All the ingredients were as fresh as the salsa and brought a unique taste to a dish that can often be average. After inhaling the delicious chips and salsa, I was only able to finish half the burrito, but that did not detract from my enjoyment or stop me from taking the rest home for later. In addition to Taco Don Nacho’s large menu, which includes tacos, burritos, quesadillas, enchiladas, mexican soups and an assortment of other meals, there is a lot of variety in how each dish is made. When you order a dish, you are able to choose the type of meat, from beef to chicken to shrimp, or a substitute if you are vegetarian. No matter which option you choose, the food is prepared with the same quality and freshness every time. Tacos Don Nacho, despite its plain exterior, really sells itself with its delicious dishes and wonderful staff. If you are looking for a no-fuss, good food place to eat alone or with friends, Tacos Don Nacho is number one.